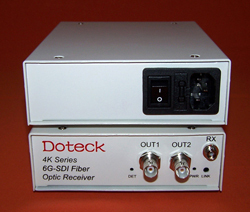 Doteck 4K series 6G-SDI UHD Video fiber optic Transmission System can transmit one 5940Mbps 6G-SDI ultra high definition video, one 2970Mbps 3G-SDI super high definition video, or one 1485Mbps HD-SDI high definition video, or one 270Mbps SDI standard definition digital video or one DVB-ASI stream through one single mode fiber or multimode fiber with the standards of 6G UHD-SDI SMPTE424M, SMPTE292M, SMPTE259M, SMPTE297M, SMPTE305M, SMPTE310M. 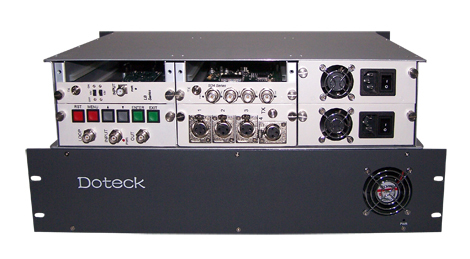 Due to the advanced fiber optic transmission and SDI 6Gbps technology , almost you need not make any adjustments, simple to set up, easy to operate, so very suitable application in TV station, digital TV, IPTV, mobile TV, mobile phone TV and other new media fields. 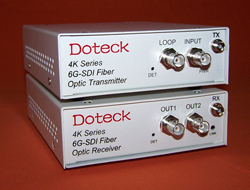 Doteck 4K series transmitter provides one 6G/3G/HD/SD-SDI input, and one loop-through for local monitoring. 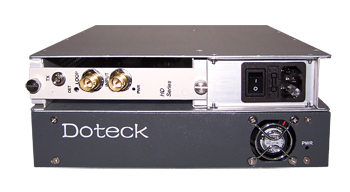 The receiver outputs 2-way parallel 6G/3G/HD/SD-SDI video.